Heat oven to 400°F. In large bowl, mix all ingredients. Shape mixture into 1-inch balls. Place in ungreased 15x10x1-inch pan. Bake about 20 minutes or until no longer pink in center and meat thermometer inserted in center of meatball reads 160°F. 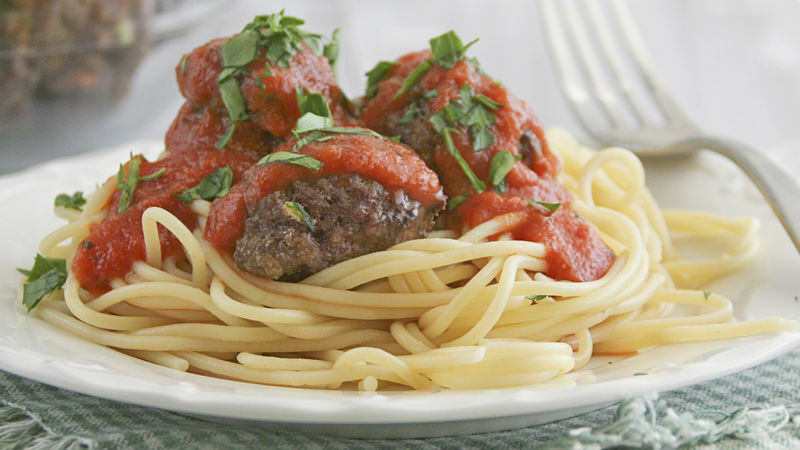 These meatballs are also good served with dipping sauces instead of with spaghetti. Try barbecue or sweet-and-sour sauce, or heated marinara sauce or your favorite tomato pasta sauce. If your kids are super picky, finely grate or chop the vegetables so they aren’t visible. Baked meatballs can be frozen. Place cooled meatballs in a single layer on a cookie sheet and place in the freezer. Once they’re frozen, transfer meatballs to a resealable food-storage freezer plastic bag and store in the freezer.